We interrupt posting the final installment of "Brainiacs" week at the cocktail party to bring you this special announcement: the world is not going to end when CERN finally turns on the Large Hadron Collider (LHC) later this year. Seriously. I wrote about this issue way back in September 2006, and tried really hard to resist commenting further in the wake of last week's news that a lawsuit has been filed in Hawaii's U.S. District Court (Hawaii?!?) 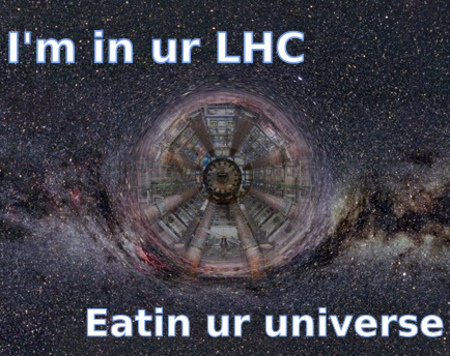 seeking a temporary restraining order against CERN and its partners in building the LHC. You are reading this because I discovered that resistance is futile. The self-styled Prophets of Doom never rest in their single-minded mission to halt scientific progress around the globe and quash the spirit of free inquiry and discovery wherever it threatens to bloom. In this case, the plaintiffs want to postpone start-up preparations for "at least" four months in order to "reassess" the collider's safety. Because, you know, it could destroy the world by creating mini-black holes, magnetic monopoles, or converting all the matter in the universe into exotic strangelets. (*cue exasperated eye-rolling*) Oh, give me a break already. This is nothing more than the latest round of fear-mongering that always seems to accompany the start-up of a new accelerator. In fact, one of the plaintiffs is none other than "former nuclear safety officer" Walter Wagner, who spearheaded the attempt to create panic surrounding Brookhaven's Relativistic Heavy Ion Collider (RHIC) -- that lawsuit was dismissed, and rightly so. News flash to Wagner (and his ilk): RHIC has been operating since 2000. The world has not yet ended. Nor did it end when Fermilab's Tevatron turned on -- not a single artificial supernova appeared, despite all the preliminary hand-wringing by fear-mongers -- or when the Stanford Linear Accelerator came online. Perhaps some of you think I am a bit too hasty in pooh-poohing the risks associated with a big powerful machine like the LHC. Let me assure you that this is not the case: I believe very strongly that science has a responsibility to evaluate the safety of its experiments, particularly for something as massive as the LHC. LHC scientists have done so. Wagner's concerns are nothing new to anyone who has followed the development of the accelerator's design and construction over the last decade or more. The inherent risks have been fully and fairly considered by the best scientific minds in the world, who take their responsibility for ensuring safety of operation very, very seriously. To suggest otherwise is, frankly, an insult to the world high-energy physics community. There have been two safety assessments already, and a third update has just been completed. ("The possibility that a black hole eats up the Earth is too serious a threat to leave it as a matter of argument among crackpots," one CERN theorist told The New York Times.) We're talking about the most expert testimony any court could hope to have on record. Why bring the courts into it at all? Because Wagner refuses to accept the scientific consensus on the issue, that's why. Apparently, he thinks he knows better than all those world-class physicists who have participated in three (to date) safety assessment reviews. Hey, he studied physics and "worked on cosmic ray research" at the University of California, Berkeley, according to Dennis Overbye's article in The New York Times, although there's no mention of Wagner earning an actual degree, apart from a doctorate in law from the the University of Northern California in Sacramento. And then he spent several years working as a radiation safety officer for the Veterans Administration. In short, he knows just enough to foster panic, and not enough to make a scientifically rigorous assessment of what the true risks are. A little learning is a dangerous thing, indeed. Pardon me for finding the "testimony" of world-class experts in particle theory more convincing than that of a retired radiation safety officer, however well-meaning. Wagner's mysterious co-plaintiff, Luis Sancho, might not even have that much background: he is described as an "author and researcher in time theory," living somewhere in Spain, "probably in Barcelona." Probably? If Wagner can't even locate his own co-plaintiff -- never mind give us any information about Sancho's scientific credentials -- why should we believe his statements about the LHC? Answer: we shouldn't. All the cool bloggers agree. But don't take our word for it, either. CERN has specifically addressed this issue on their Website, where you can find lay-friendly summations of the salient issues, as well as links to other relevant official documentation. There's no big conspiracy to hide the "truth," and this is not, as Wagner claims, mere "propaganda." If anything, it's Wagner who's peddling the propaganda. In fact, part of the LHC's current PR problem is that physicists are so darned honest in their assessments, they are reluctant to go on record as definitively ruling out even the most unlikely of scenarios. And that gives folks like Wagner the ammunition they need to foster unfounded panic. Perhaps my favorite comment on the whole LHC Doomsday scenario appeared in a thread at Shakesville, where a poster identified as Astaea wrote, "Wasn't this an Angel episode? We aren't in danger till one of the scientists gets dumped by his girlfriend." Astaea is referring to a Season 2 episode of Angel entitled "Happy Anniversary," in which a brilliant physics grad student's experiment on freezing time nearly ends the world. It actually has very little to do with fears surrounding the LHC (although Sancho is apparently working on theoretical aspects of time), but I had a lot of fun analyzing the episode in a chapter of (shameless plug alert!) my book, The Physics of the Buffyverse. In the episode, Gene (the physics student, dubbed "Time Boy" by a jealous colleague) assures a curious co-worker that his experiment isn't really about freezing time, "although that's how it would look to an outside observer." Rather, he's trying to carve out a teensy-tiny piece of space-time and remove it from reality. Anything contained within that moment would exist in its own bubble universe, forever unchanged. Time would have no meaning. He just can't get his experimental apparatus to work correctly; his math isn't quite right, apparently. I'm sure there's lots of physicists out there who could relate to Gene's dilemma. He has something they lack: a technologically advanced, fanatical demon sect intent on ridding Earth of the pesky human race once and for all. They correct his math, and when he returns to the lab and enters the new parameters, voila! A tiny drop of mercury is suspended in a timeless bubble, right there in the lab, until he turns off the machine. Like any respectable scientist, Gene has taken safety into consideration: his experiment is equipped with various safeguards to contain the experiment, lest that tiny bubble universe escape its confines, spread, and eventually engulf the entire world. But then he overhears his girlfriend confessing her intent to break up with him after their anniversary dinner (and requisite "sympathy bone," as the girlfriend's confidante succinctly puts it). Frankly, Gene kinda loses perspective for a bit at this depressing news. He decides to set up the experiment in his bedroom and triggers the device at the (ahem) climactic moment. Things might still have been okay, if it weren't for those meddling demons. As Gene and his (soon to be ex-) girlfriend are suspended in their private bubble, the demons remove the safeguards, and the bubble starts to spread outward, freezing everything it engulfs in its path -- until Angel managed to shut down the system in the nick of time. The bubble collapses back in on itself, and time resumes for everyone. There's a lot to criticize in the science of this episode if one is inclined to nitpick. In some ways, it's typical "Hollywood science": a smattering of nifty-sounding physics concepts and buzzwords that, when parsed, don't seem to make much sense. In this case, you've got the notion of carving time into infinitesimal pieces --something (if memory serves) mentioned in Brian Greene's The Fabric of the Cosmos. You've got elements of tabletop plasma wakefield accelerators and laser trapping in Gene's fictional experimental apparatus. And you've got elements of relativity and black hole physics. At one point, Gene compares the effect of his temporal experiment to "a tiny event horizon." This doesn't mean that his premise is feasible by any "real world" standard in physics. He says that if a single drop of mercury is dropped into the field created by his tabletop accelerator, and if the particles that make up the laser beams are moving at just the right velocity (the speed of light, one assumes), the mercury would be accelerated completely out of our space-time. Accelerating something to exactly the speed of light would, indeed, cause time to contract to nothing from the perspective of that object, per Special Relativity. The catch is that no object with mass can ever reach the speed of light, even tiny subatomic particles. The LHC and other accelerators can speed up particles to within 99.999% of the speed of light, but no matter how much additional power they feed into the machine, because there is a corresponding increase in mass, the particles never quite reach light speed. It would require an infinite amount of energy. Extreme gravity -- such as that of a black hole -- might do the trick, at least, as Gene points out, from the perspective of an outside observer. Your basic black hole physics states that as an object gets closer and closer to the event horizon, someone watching its approach would see it moving more slowly the closer it gets, until it stops entirely just before crossing the event horizon, on the verge of falling in for all eternity. (From the perspective of the object itself, of course, it would continue falling into the black hole and be "spaghettified" -- Kip Thorne's colorful phrasing -- by extreme gravity along the way.) Does creating a black hole in a lab the size of Gene's seem a bit far-fetched? Sure, especially when the episode first aired. But science presses forward, and the March 2008 issue of the IEEE Spectrum magazine has a fascinating article on how scientists at the University of St. Andrews in Scotland have created an "artificial black hole" using optical fiber -- or at least something with the telltale properties of an event horizon. Maybe Gene was just really cutting edge. The theoretical possibility of the LHC creating "mini-black-holes" is one of the Doomsday scenarios causing the current brouhaha, so this notion isn't 100% far-fetched. But here, again, there is a catch: Hawking radiation, which causes a black hole to gradually evaporate over time, proportional to its size. The bigger the black hole, the longer it takes to evaporate, and the smaller the black hole, the less time it takes to evaporate. If the LHC does, indeed, create mini-black holes -- and this is still a matter of hot debate among theorists -- they would be roughly the size of a subatomic particle and would evaporate in fractions of a second -- long before they could pose any risk to the world's continued existence. The same would hold true for Gene's temporal experiment. I personally found it impressive that Angel's writers even attempted to build an episode around something so complicated and esoteric. They get points in my book for their cutting-edge science flair, even if everything is stitched together rather awkwardly. (A Season 4 Angel episode entitled "Supersymmetry" does a better job in this regard, cleverly drawing on the notion of string compactification in string theory as a possible mechanism for the creation of portals to other worlds in the Buffyverse -- and using all the associated jargon correctly in the process.) It's an entertaining premise, even if it's wildly unlikely. The Buffyverse is a fictional world, after all, and is therefore not necessarily constrained by the laws of physics as we understand them. It only has to be consistent with its own laws. The same cannot be said for Wagner's contentions about the LHC. Honestly, based on what I've heard from every single physicist I've spoken with about the issues over the years, the "risks" he cites are almost as wildly unlikely as the premise of "Happy Anniversary"'s temporal physics experiment gone haywire. And Wagner doesn't have the excuse of a fictional universe to fall back on. A whole string of unlikely events -- each with an infinitesimally small probability on its own -- would have to all come together perfectly, at just the right time, and in just the right order, to bring about the end of the world as we know it. Wagner might as well file a lawsuit saying the LHC should be postponed until we've established that a fanatical demon sect from a parallel universe won't over-ride the accelerator's safeguards to trigger his Doomsday scenario. We notice your so snidely hidden amongst the chaff, "Because, you know, it could destroy... converting... the universe into exotic strangelets." The reason why we chose to seek the injunction in Hawaii is because we will not incur the onerous expense (nevermind the grounding of the MD-80's) to transport any evidentiary "exotic strangelets"-with the ongoing economic meltdown 'whoa Bernanke'-ok slowdown, WELL OK!, quarterly incongruiences- anyway since they placed those big magnets opposite the state of Hawaii we have documented evidence of ironic nasal and navel ring piercings dramatically drooping. This is a direct threat to National Security. If Hawaii's exotic strangelet community is suddenly experiencing ironic piercing droops coincident with the big magnet emplacements in - it is France isn't it? - anyway we want it stopped and we want it stopped now. The Arizona has already been affected - say what? that happened that long ago? Well anyway our strangelet community is affected isn't it? Yes Mr. Spitzer, Kirsten's latest video seems to have been fogged up. That settles it! Objection your Honor! Saving the world from killer black holes, stranglets or other exotica that the LHC might produce is all very admirable. Is that the only motive behind this lawsuit? On his website www.lhcdefense.org, Walter Wagner claims it will cost in excess of $100,000 to bring legal action against the LHC and invites people to send a suggested donation of $10. Now I don't know if 10,000 people will think this is a worthwhile enough case to send their hard-earned dollars. But I'll put my money on the physicists' assessments being right and send my donation to another charity instead. Is Kip Thorne a pastafarian? When you're making up names for your new pet sciences, can't you at least choose one which doesn't sound like the plot device in a bad **Star Trek** episode? "Mr. Data, modulate a tri-phase dekyon beam to counter the effects of the anti-time fissure upon our biogenic fields." "Captain, according to the basic principles of time theory, that action has a 37% probability of overloading the quantum resonance flux in our warp core." "That may be a risk we have to take. [tugs on shirt] Make it so." There's no such thing as "time" so how could there be a plausible theory? "Time" is only an abstract concept we have invented to pretend that we kind of understand some things. Actually, it was probably invented by lawyers. PS: If the LHC at Cern does create a black hole which ends up eating the solar system, boy are you guys gonna be sorry you scoffed! Don't know Thorne's religious leanings, but he SHOULD be a pastafarian, given his fondness for pasta analogies. Time theory? Oh my God! Someone please tell me why I didn't study "time theory" before. Tomorrow I'll search for a time theory course in some universities. Do you think that it does exist? Larry Niven in "World of Ptavvs" (1965) postulated the existence of a time halting emergency suit for space travelers. When the traveler's ship is about to blow up, crash, etc. they jump inside and turn it on. When your rescue team shows up they turn off the generator and out pops the adventurer. any weight in France or Switzerland. As the Chinese say: "where there is confusion, there is profit." There's probably a killing to be made here selling world-gobbling-strangelet insurance. One could keep the premiums low and still do quite well, I should imagine. Ever heard of an anti-neutrino? Kinda puts your time theory into a cocked hat. why are people, like Wagner, are taken seriously? This is a fellow who got a minor in physics, then went to law... and we should take his word than to... how many scientists/physicists been working at CERN?? I do hope people realized of how much of a crackpot Wagner really is. 1st scientist "What are you working on?" I remember reading awhile back about the upcoming LHC project at CERN, and how my eyebrows elevated at seeing mention of 'mini-blackholes', etc. Able to direct sub-atomic particles like a maestro, but can't hold a press conference without stepping into oncoming traffic. I winced. My brother, a recently retired Air Force pilot, interjects that the venerable Piper aircraft company was destroyed in a lawsuit brought by the widow of an owner of an ancient Piper, who flew it into a stall in defiance of prominently-posted cockpit warnings against the maneuver, whereupon it fell out of the sky, killing him. I was a nuclear power plant operator for the Navy, during the Arab Oil Embargo, so the solution to that certainly seemed obvious at the time. Little did I know, commercial construction then in progress would be our last. Your indignation at the lawsuit against CERN is perfectly understandable, and I'm guessing that under current conditions the proceedings will be a formality. But, insofar as the general public & FUD go, the advice to car drivers against being 'dead right' pertains. this is the end of the world"
"The possibility that a black hole eats up the Earth is too serious a threat to leave it as a matter of argument among crackpots," one CERN theorist told The New York Times. This is the most important quote. In it sums up that the scientists take ALL apparent risks seriously and that it HAS been weighed and found lacking in merit. An investigation WAS warranted, and now has been thusly concluded (thrice over!). I remember this coming up a few years ago. The LHC is no more nor less dangerous than before. People are merely constantly on edge these days; it's hardly a directed effort against scientific progress (it would certainly be myopic to ignore all the other parts of life fettered by this 1984-esque fear), it is a social issue wherein physics is the current innocent casualty. My friend called me to tell me about the lawsuit, probably hoping to get a rant out of me. As the conversation went on, he quipped, "You know before the nuclear bomb was dropped they were worried it might set the atmosphere on fire?" "Fortunately we've since found out they are perfectly safe!" I have equal faith that the LHC is perfectly safe; it will perform exactly as designed. I understand you are a science writer, not a scientist or physicist, though you apparently speak with lots of physicists. The ones you speak with are conning you. Unlike yourself, I have worked extensively in physics for many years, and have taught extensively in science and mathematics for many years, with excellent credentials for doing so. Here's the CERN PR release in response to this: "If the LHC can produce microscopic black holes, cosmic rays of much higher energies would already have produced many more," the statement added "Since the Earth is still here, there is no reason to believe that collisions inside the LHC are harmful." That argument was torpedoed two years ago, which is why CERN was forced to go back to the drawing board to dream up a new argument. Yet they trot out that failed argument to a gullible public. I have discussed this before on your blog, but apparently you've forgotten. In sum, cosmic rays in nature routinely strike the upper atmosphere, possibly creating microblackholes. If so, they are created at COM speeds that are relativistic relative to earth, though slower than the incoming cosmic ray. Anyone with a background in fixed-target accelerators knows this principle, a background you obviously lack. At those speeds, the microblackhole would simply transit earth in 1/4 second, with likely no interaction [or if it did glom on to a single nucleus, it would barely slow down]. That is not what is proposed at the LHC. The LHC proposes to make microblackholes [yes, they do, look at the ATLAS homepage] to investigate Hawking Radiation. If they are capable of being made, an appreciable percentage would be made at rest relative to earth, such that they would be captured by earth's gravity and endlessly orbit [if they don't evaporate]. This would give them plenty of time to grow larger, with a faster and faster accretion rate as they got larger, to where perhaps a decade, a century, or a millenia from now they would be able to accrete the planet. The safety studies that were done earlier relied entirely upon unproven Hawking Radiation. It doesn't matter how many loony physicists who believed the false premise of their cosmic ray argument, and who also believe in the veracity of Hawking Radiation, say that Hawking Radiation would work, the fact is it remains an unproven theory. It might be wrong. Polls of physicists I've seen show about 3/4ths have their doubts of its veracity [with the average of doubt be at 10% believing it will fail, 90% believing it will work]. Yet that is what the LHC proponents want to rely on for their safety factor. Still further, the suit is about more than just the safety. It is about the fact that a proper safety study addressing that [and numerous other issues] was not done, but was promised to be released by January 1, 2008, and then when that did not happen, was promised to be released by March 1, 2008. When that did not happen, suit was filed to insure that the safety study is released and reviewed before start-up of the LHC. Still further, the suit was initiated by not 2, but by 7 scientists and engineers. Still further, numerous other physicists with excellent credentials [neutrino experiments under their belt, etc.] are supporting the suit by way of email, even if not signed on officially [to protect their careers, etc.]. You really do owe your readership an apology. I haven't forgotten your prior comments. I merely find them unconvincing. Thanks, but I owe nobody an apology, and I stand by what I have written. you apparently speak with lots of physicists. The ones you speak with are conning you. the suit was initiated by not 2, but by 7 scientists and engineers. I've been following this topic with interest and I see no support for Wagner. Not one blogger, not one physicist. But Jennifer, married to a cosmologist, writing in this field for quite a while, is being conned by "the ones" she's speaking with. But, now that I see there are five more people pressing this lawsuit than I previously thought, I'll have to reconsider my opinion. Bob Park also made a comment on this in his last week's "What's New". LHC: A KNIGHT ERRANT TILTS AT HIGH-ENERGY WINDMILL. You no longer need to take my word about the invalidity of the cosmic ray argument that even luminaries such as Steven Hawking are still spouting off about as the "safety net" that proves the LHC safety, as he did a few weeks ago at Cal Tech. Rather, the LHC Safety Assessment Group also has recognized its invalidity, and are searching for an alternative safety argument. Specifically, in a power-point presentation given recently at UC Berkeley by Michelangelo Mangano, he concluded that any microblackholes created in the upper atmosphere in nature by high-energy cosmic ray impacts would leave the microblackhole rapidly transiting earth, or as he wrote: "they fly through the Earth like a neutrino". In my terminology, I referred to them as "neutrino-like". Not a whole lot of difference there. He further concluded that "At the LHC, some of them will have v< 10 kh/s, will be gravitationally trapped, and could start growing". Not a whole lot of difference between my referring to them as being "gravitationally bound to earth". Now, if every time I turn around I find that the LHC theorists are making fundamental errors of physics as it pertains to safety, which I feel obliged to point out to them, why should I take their assurances that they can guarantee that we will be safe? Their track record is abysmal. I happened to make a living for many years by pointing out errors of logic to scientists - that's what nuclear safety officers do. We don't go around letting ourselves be bought-off [or, at least, the ethical ones don't] by someone willing to pay huge salaries and enormous perks if we'll come back with a clean bill of health for whatever their pet project happens to be. Let me give you an example of the thick-skin I've developed over the years from insulting comments from ignorant people. A few years back, in April, 2001 to be precise, I was attending a safety workshop in Utah in which the main topic of discussion at the time was the "temporary" storage facility that was being sought by some to be built in the west desert of Utah, as an interim storage facility for reactor casks filled with spent fuel rods. This was occassioned due to the fact that the permanent storage facility has been delayed/held-up by people with an anti-nuclear agenda. The proposal that was made was to lay a thick concrete pad, and set the casks in the open air on top of the pad, surrounded by a security fence and guards. I was the only one of about 40 attendees who objected to the overall design. I strongly suggested that it should instead have the casks buried, with the concrete pad on top. I suggested that the design that was proposed left the casks subject to attack from terrorists, who could by the use of a few suicide pilots, attack the casks with planes laden with explosives, followed by a second wave of suicide pilots who could attack the damaged casks with fuel, incinerating the waste and allowing it to blow into Salt Lake City and other down-wind areas. Everyone laughed at my suggestion that suicide pilots might attack within the United States. One person, who had just put to bed the waste from Three Mile Island [TMI], stood up and said that they had covered their waste with a concrete slab. As events subsequently proved, my 'fears' were well-founded. Sometimes, as it turns out, one has to be willing to withstand the taunts of the more ignorant ones surrounding him. Now, at any time that anyone from the LHC wishes to engage in a serious discussion of a VERY SERIOUS ISSUE that the LHC might make non-evaporative microblackholes, I would be willing to discuss this with him/her. The stakes are too high to simply sweep this under the carpet by ridicule and outright lies, by "physicist-bookies" who are willing to gamble with everyone else's lives for their own personal advancement. Wow, enjoyed all the comments. Deep thinking. Better than Star Trek. Not as good as Baywatch.